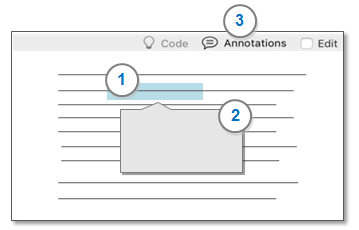 Annotations let you record comments, reminders or observations about specific content in a file or node. Annotated content is highlighted in blue and the text of the annotation is displayed in the Annotations tab at the bottom of the window. 1 Annotated content is highlighted in blue. The color will be different if the text is also coded and highlighting is turned on. 2 The annotation is displayed in a popup. 3 Click to display a list of all annotations in the open file. Double-click on an annotation in the list to navigate to the annotated content. If you code content that contains an annotation—you can see the annotation in the node. For example, if you code text at the node Climate, when you open the node you can see the coded text along with any annotations. What types of files can I annotate? Select the content you want to annotate. On the Analyze tab, in the Annotations group, click New Annotation (or press ⌘+SHIFT+A). In the popup, enter the annotation, and then click outside the popup or press ⌘+Enter when you are finished. To see all the annotations in your project, in Navigation View, click Notes, and then click Annotations. In the left margin of your open file, click to display a list of all annotations in the open file. Navigate to the annotated content—single-click on an annotation in the list. Display the annotation in a popup—as well as navigate to the annotated content—double-click on an annotation in the list.